1918 Wound Badge in Gold, solid replica of the first pattern Wound badge from WWI. It has a golden finish and is fitted with the correct original style needle pin. 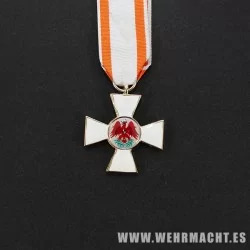 The Wound Badge was a military decoration first promulgated by Wilhelm II, German Emperor on 3 March 1918, which was awarded to wounded or frostbitten soldiers of the Imperial German Army, during World War I.